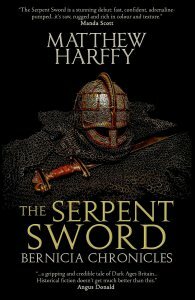 Matthew Harffy is currently writing a series of novels set in seventh century Northumbria. The first book isThe Serpent Sword. The sequel is The Cross and The Curse. In his day job he is a manager of fifteen technical writers, so spends all day writing and editing, just not the words he’s most interested in! Prior to that he worked in Spain as an English teacher and translator. He has co-authored seven published academic articles, ranging in topic from the ecological impact of mining to the construction of a marble pipe organ. Matthew is outnumbered at home by his wife and their two daughters. When not writing, or spending time with his family, Matthew sings in a band called Rock Dog. In the course of my perusing for books to read I am occasionally offered the chance to read a book prior to it being released. Such was the case with this book, The Serpent Sword by Matthew Harffy. Set in 7th century Britain, a time of unsettled violence where the prowess of warriors and the shield wall determines the fate of kings among the disparate factions that inhabit the island. Angles, Seaxons, Waelisc vie for control and into the mix brought about by the chaos of war is a lawlessness perpetrated by bands of desperate and ruthless outlaws. Beobrand, a young farmer from Cantware(Kent) travels to Northumbria to seek and join his brother, a warrior in the household of King Edwin. 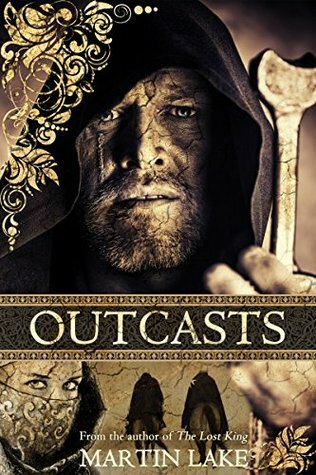 Beobrand has lost his mother and sisters to a plague and his father to a mysterious fire and his wish is to become a warrior like his brother. The tale is one of suffered loss and helplessness as Beobrand strives to avenge the murder of his brother and the paths he takes to ease the burdens of his troubled mind. The author has done a splendid job in crafting a tale that is not only historical but very entertaining as well. He captures the mood of the times in such a fashion that the reader feels the strife and tensions of this brutal time from the ethos of the warrior class to the peasants and craftsmen who struggle to survive the violence and the conflicts of competing religions and peoples. The author also makes you feel what it is like to stand in the shield wall as warriors perform heroic deeds or as they fall in the attempt. It is a stunning debut from Mr. Harffy and I look expectantly for more from him as he continues the story of Beobrand. A two thumbs up recommendation and 5 stars. I recently had the opportunity to read an advance copy of Andrew Latham’s ‘The Holy Lance’. Initially I was hesitant, I have to admit. I am reasonably familiar with the Knights Templar in both popular myth and actual historical record, and am, frankly, a little sick of the endless connections made between the Templars and various supernatural or secret cult activities. I was pleasantly surprised, therefore, to read the book and discover that, although it revolves entirely around a group of Templars and the eponymous artefact, there is not a hint here of the ‘secret society and weirdo damned Templars’. This is a tale of knights, duty and the battling of inner demons, not the Rosicrucians or the Masons in armour trying to hide the body of Christ or some such. This is a most interesting and thought provoking entry by Martin Lake. Jerusalem is under siege by a Muslim horde led by Saladin and is being defended by the respected knight, Balian. With so few knights to defend the city, Balian bestows knighthood on ordinary peasants and that has unexpected results for those who survive the fall of Jerusalem. The tale follows the separate paths that the main characters have to follow in order to survive or to seek out their loved ones. One of the more salient features of the story is how the new ‘knights’ are treated by their fellow Christians as opposed to how they are treated by their Muslim captors. The story is full of the descriptive talent I’ve come to enjoy from Mr. Lake as he takes the reader on a journey to many of the historical sites of that part of the world, Jerusalem, Tyre, Antioch & Baghdad, for example. The author has also given us many great characters to grow fond of or to despise. I enjoyed this tale of the seemingly endless conflicts to control The Middle East and I am looking forward to finding out what happens to the characters as the story continues in the sequel. 4 stars. Wow, this is sure exciting stuff. Who would have thought that me, a humble yet insightful reader and reviewer of books, would make it to the most prestigious blog tour of SJA Turney? I have known Simon for a couple years now, a relationship brought forth through the great bringer together of old friends and maker of new ones, social media. In fact, it is his fault I have a Twitter account. I had finished reading Marius Mules IV and noticed in the About the Author section that Simon listed his Twitter handle. Well, I enjoyed the first four books in the series so much I just had to tell him and @hooverbkreview was born and began what has become a pretty cool network of authors, reviewers and other fellow travelers. Soon I had inveigled my way into his confidence and got on his list of beta readers which is really nice because I get a signed copy of the books and I know that they will be worth a small fortune at some point in the future. So if my writing career doesn’t take off then I have those signed editions to fall back on in my retirement and now I’ll have one more as I have just finished his latest, Praetorian: The Great Game. Where to begin? The protagonist, Rufinus, the depth of scenic detail, the mesmerizing plot twists? That sounds like a logical order to proceed with. Rufinus is your average legionary doing the foot slogging, shield walling duties of a Roman soldier all for the glory of Rome and the Emperor Marcus Aurelius. Then in one of those ‘no good deed goes unpunished’ moments his life takes a radical detour. Without going into too much detail as to not spoil it, Rufinus is promoted to The Praetorian Guard and is subsequently posted undercover at Commodus’ sister Lucilla’s villa. From then on he finds out just what kind of man and loyal soldier he is. He is tested time and time again managing to emerge stronger as a character after each ordeal, physically, emotionally and rationally. A fascinating character developed beautifully by the author. That holds true for the rest of the cast of characters as well. The two Praetorian Prefects, Paternus and Perennis, the dark and visceral Dis and the savage beast called Tad are just a few of the more interesting players. The pace of the story moves along readily and builds to an exciting climax and has within it moments when I would pause and say ‘okay, I didn’t see that coming.’ Rest assured that you will be entertained and maybe even educated a little about the world of Gnaeus Marcius Rustius Rufinus. I vow by the seven sacred you know whats that this is a 5 star winner. 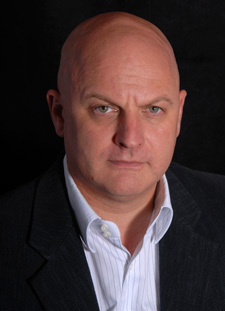 Let’s all give a big Hoover Book Review welcome to today’s guest, Simon Turney. Welcome, Simon and thanks for taking the time to answer a few questions from this humble yet insightful reader and reviewer of books. How does it feel to have Praetorian published after such along interval between conception and publication? I have been impressed in all of your work with the amount of descriptive detail you include in the surroundings, the architecture and just the way you put the reader inside the luxuriousness of a place like the Villa Hadrianus. When you visit a site for a book how long does it typically take until you have enough inspiration for your imagination? In other words how do you bring to life a site that has stood idle for centuries? Funnily enough, this is to some extent the subject of a guest post I did a couple of days ago for https://forwinternights.wordpress.com/ … I’m a great believer that a scene in a book feels a great deal more real if the author has put their heart and soul into the location, and the best way to do that is to experience the place yourself. I try and visit every location I use (it’s not always possible, but I do my best.) When I visit a location, first of all I have my camera to hand at all times. I take a lot of photos. That means that when I come to write about it, probably months later, I can refer back to see, for instance, whether one building is visible from another, and such like. I also pay attention to smells, sounds, terrain and wildlife. Are there terrapins in the pond? Do you break into a sweat on the angle of approach? Is there the scent of jasmine in the air? These are the things that bring a location to life. Of course, the amount of detail you throw into the scene is a fine line too, since loading it down with too much can impede the pace, but a good description turns a scene from ‘mmmm’ to ‘wow!’ Because of the different senses I need to record, as well as my camera, I carry a dictaphone, on which I keep seemingly endless notes. I am careful enough in selecting locations that it never takes long for inspiration to strike. If I cannot see the scene in my mind’s eye within minutes, it’s the wrong location! As for the bringing to life a long-dead site, I would suggest readers pop over to forwinternights and read the blog I posted, which goes into some detail on that. 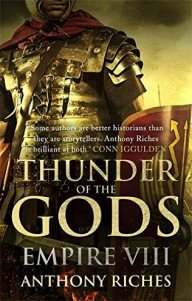 In any story involving the Roman Legions there is going to be violence and to bring the reader into what it is like to stand in a legion shield wall or even in a street fight there has to be some blood and gore. Do you ever question any of the gory passages you write as to whether it might be too much? Oh yes. In fact, while it’s nothing to do with battle, there is a torture scene in Praetorian that is a vastly toned-down version of the original. My editor suggested I cut it down and she was, in retrospect, correct. Even now, going back over the original makes me wince and makes my eyes water! Similarly, in The Pasha’s Tale, which has just undergone its final edit, I have completely removed a scene in which a household of civilians is cut down. It was, in the end, seemingly too much for the tale, and so joined so many other scenes in ‘File 13’. Oddly, I don’t think I’ve ever toned down a battle scene. Battle is in its very nature brutal, and those people who are reading a novel about the legions at war are almost certainly expecting such vicious description. In fact, some of my readers have expressed disappointment at lack of violent bloodshed from time to time. What I am turning away from more often is non-battle brutality, since scenes like that are far more shocking and unpleasant. Another facet of your writing that I enjoy is your usage of colorful phrases. For example, the seven sacred shits of Jove. How do you come up with these nuggets? Simply: I have no idea! I have a peculiar imagination as anyone who knows me will verify. I tend to be very inventive with my phrases even at home. I have been known to shout things like ‘Turdhoney!’ when I drop an egg on the pantry floor. Words just fit together so well into odd phrases even if they shouldn’t. More so, if they shouldn’t. I trained with the best, mind. My German housemate at University initiated the phrase ‘suppurating, buggering heck!’ which remains one of my faves. Cursing and swearing can be horribly offensive and it irritates me to hear people using gratuitous bad language out in the streets. But somehow the offensiveness of an imprecation is inversely proportional to the humour within. If what you shout when you drop a rock on your toe is odd or funny enough, people will laugh rather than taking offense. Do you have plans to see what’s in store for Rufinus? Hmm. I nodded to this with your first question, didn’t I? There are years of fun ahead for Rufinus. For a start, books 2 and 3 will see him variously at the family estate in Hispania, in southern Gaul, in Rome and Ostia, and even out in the wilds of Dacia (modern Romania.) There are still an array of dangerous men in the Roman court, including a couple of well-placed men whose actions will change the course of Commodus’ reign. Be sure that Rufinus has a part to play with them. And over in Dacia sometime soon, two future usurping emperors are busy. Book 2 is already planned down to a chapter level ready to write and book 3 is a nebulous plot at the moment. Beyond that? Well, the sky’s the limit. As with Marius’ Mules, as long as people want to read about Rufinus, I’m happy to write about him. Finally, what’s next for Simon Turney? What are you working on now? I am just putting the finishing touches to The Pasha’s Tale (the fourth and final installment of the Ottoman Cycle) which I will publish once the cover is complete, with a tear in my eye as I say goodbye to writing about 15th century Istanbul. Next week I begin work in earnest on Marius’ Mules VIII: Sons of Taranis, which I am already champing at the bit over. That should be out in the late summer this year, all being well. After that, sometime towards the end of the year, it is the turn of Praetorian book 2. In the meantime, there are three side projects already written and waiting for publishing, including the joint work with Gordon Doherty, which is one of my favourite things I’ve ever written. Shortly, we are going to embark on book 2 of that series too. All go at Chez Turney as you can see! Never a dull moment. So today Praetorian is released into the world, and the blog tour begins. Who better to kick it off than me, eh? So what is Praetorian: The Great Game, and how did it come about? Well some years ago, I spent many months sweating through a tale I called Legion 22. It was atmospheric, evocative and character driven. It was also, when I was 90% through it and went back to read through so far, complete rubbish! Oh it was a nice tale, but to pull it together and make it workable would take almost as long as it had taken to write in the first place. Consequently, I gave up in disgust and assigned the book to ‘File 13’.